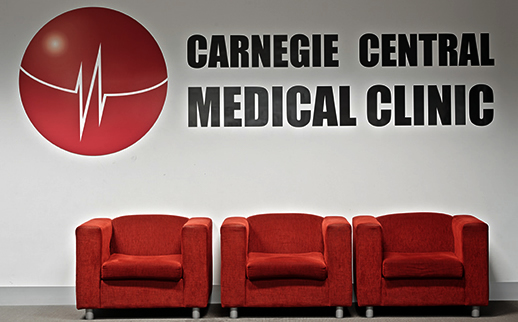 Whatever your stage of life, the Carnegie Central Medical Clinic can provide you and your family with the appropriate care and treatment that you require. Whether your child requires an immunisation or if you require a full and comprehensive health assessment or you are at the stage of life where you require the attention of a geriatrician, we have the right Carnegie doctor for your needs. We also offer an interpreter service with some of our doctors and staff speaking French, Russian, Mandarin, Japanese, Arabic and German. If you require the services of an interpreter, we can arrange this service for you free of charge. This means that not only do we offer a comprehensive health care service but we also offer an all-inclusive health care service where language is not a barrier. We are located on the 2nd floor of the Carnegie Central Shopping Centre, which is conveniently situated in close proximity to bus and train stops that are only 50 metres away. For those driving to our clinic, we offer plenty of basement parking for all our patients. Accessibility to your GP in Carnegie is important which is why we offer extensive opening hours. We are open 7 days a week from 8.30am to 8pm from Monday to Friday and from 9am to 1pm on Saturdays and Sundays. We even open on public holidays! Not only that, we extend our level of care outside of our normal office hours by offering home visits and phone advice to our patients. With our proactive approach to your health, the Carnegie Central Medical Clinic offers you a health care experience like no other. Whether you're looking for Doctors in Carnegie or a GP in Oakleigh, contact us today for more information.